Reviewing and updating existing site investigation and risk assessment targets based on extensive research and gathering of site specific data, involving extensive discussions with a number of stakeholders. Following demolition of the main buildings including the removal of notifiable asbestos, VertaseFLI undertook a comprehensive survey of the factory waste water treatment plant (WWTP) including large storage and bio filter tanks. This plant had to be maintained and operated throughout and after the remediation works as part of an ongoing de-watering requirement. This was in addition to the temporary WWTP required for day-to-day activities. Contaminants on the site were primarily chlorinated solvent based, some volatile and highly odorous. Strict management of staff safety and impact to the local community was necessary, including reduced working areas, covering working faces, covered and forced vented windrows, operating within former buildings and operating odour neutralising equipment directly on odours operations and as a perimeter misting spray. 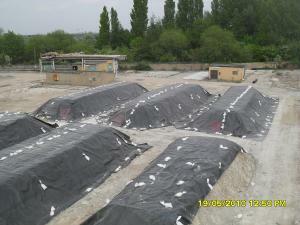 Ex-situ bioremediation was used at its limits especially considering the required environmental management. Risk Assessments and targets were constantly reviewed as new and unforseen contaminants were detected. Numerous UST's and large amounts of redundant buried pipework (some lagged with asbestos) were present and required decommissioning. 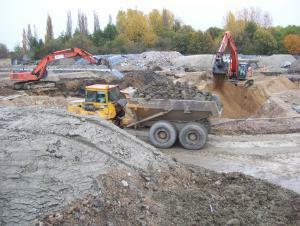 Demolition produced 40,000m3 of recycled aggregates. Over 150,000m3 of soil were treated for reuse.